Grilled Chicken Greek Salad ~ if you love a great main course salad then try this healthy 30 minute meal made with lean grilled chicken breast! It’s a light, low carb, but totally satisfying dinner idea. *I’m partnering today with Vital, a spice company with a cool new concept. They gather spices from around the world and offer them up in perfectly curated Exploration Spice Box collections so you can cook authentic International dishes at home. Today we’re visiting Greece & the Aegean islands! Everybody’s had a grilled chicken salad before, but when you tweak it just a little to give it an authentic Greek spin, you get something really special. My Greek Exploration Spice Box has everything I need to give this salad a Mediterranean vibe. I step up my chicken breasts game with a mint and lemon rub, along with minced garlic and oregano. The classic olive oil and lemon dressing gets a boost from Vital’s traditional Greek herb mix. 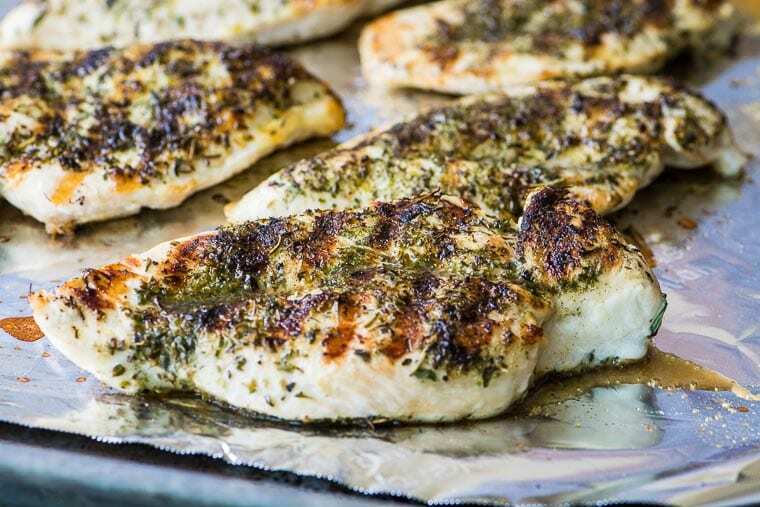 The key to getting a tender moist grilled chicken breast is to grill it briefly in a grill pan to get those pretty and flavorful char marks, but then to transfer the chicken to a moderate oven to finish the cooking gently. And definitely don’t overcook it, the meat is done when it registers 165F on a thermometer, and that only takes about 10 minutes in the oven. TIP: Buy thin sliced chicken breasts, or slice them in half yourself so they are not too thick. (You can also pound them thinner) Thinner breasts will cook quickly and evenly and won’t have a chance to get rubbery. I let the chicken cool briefly and then slice them on the bias for perfectly tender juicy chicken. Allow 1/2 ~ 1 breast per serving, depending on how hearty you want your salad. TIP: I used skinless boneless breasts, which are lean and healthy, but the herb rub gives the chicken the appearance of a crisp skin without the extra saturated fat ~ it’s a win win. With this little collection you can make all kinds of Greek inspired recipes. I’ve dabbled in Greek food on the blog, and they’ve become some of my favorite recipes, like my GREEK MEATBALLS IN LEMON SAUCE, and my GREEK STYLE STUFFED ARTICHOKES. 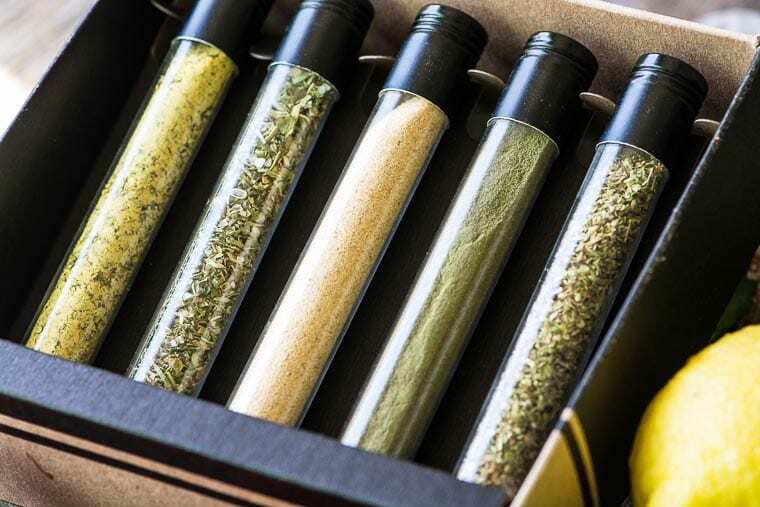 If you love to cook International food but don’t have the knowledge or the access to specialized spices, you might like the idea of Vital’s Exploration Spice Box Membership ~ you’ll get a new spice collection delivered 4 times a year, to coordinate with the seasons. It makes a great gift, too, for anyone who loves to cook. 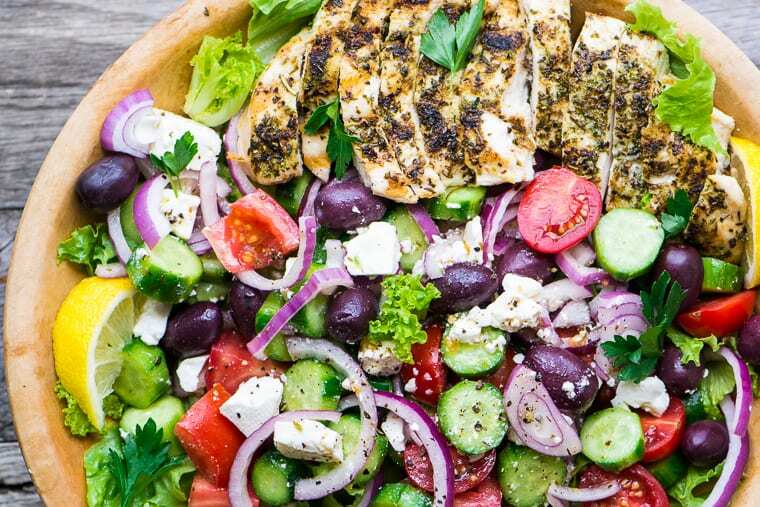 Grilled Chicken Greek Salad ~ if you love a great main course salad in the warmer months like I do, then this vibrant Greek salad topped with lean grilled chicken breast will win you over for sure. It's a light but totally satisfying main course salad. Heat a grill pan over medium high heat. 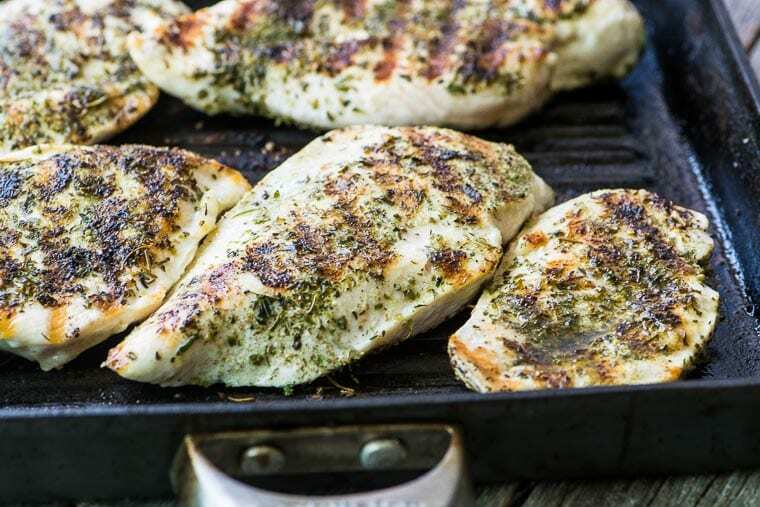 Brush chicken breasts lightly with olive oil and rub both sides with a light coating of the Mint & Lemon Rub, Minced Garlic, and Oregano. Add a pinch of salt and pepper. Grill the chicken for about 2-3 minutes per side, or until you get nice grill marks. Transfer the chicken to a baking sheet and bake for an additional 10-12 minutes, or until the chicken is cooked through and registers at least 165F in the center. Set aside. Put the lettuce in a large salad bowl. Put the onions, cucumbers, tomatoes, olives, and cheese in a separate bowl. Toss with enough of the dressing to moisten. Add this mixture to the salad bowl with the lettuce. Add the grilled chicken and drizzle with more dressing just before serving. When you use dried spices, crush them between your fingers to revive the essential oils as you add them to your recipes. You might try grilled shrimp in place of the chicken in this Greek salad. 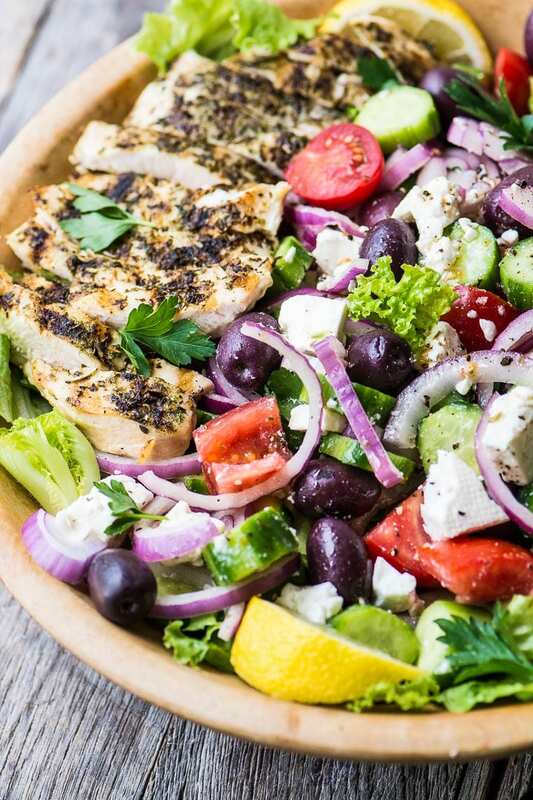 Thanks for pinning this grilled chicken Greek Salad! This salad is so rich and nutrient-dense, Sue! Preparing and consuming healthy food is so easy with your recipes! We’re having a bit of a heat wave this week, and your gorgeous salad is exactly the kind of dinner I’m craving! I love salads all year long but they certainly taste that much better when the veggies are in season. Regular grilled chicken can sometimes be bland but I like the idea of using the rubs and spices. I’ll have to try this combo! Really gorgeous salad! I could eat this all summer long!! Me too Deborah ~ thanks for stopping by!! That is one beautiful salad that you have there. 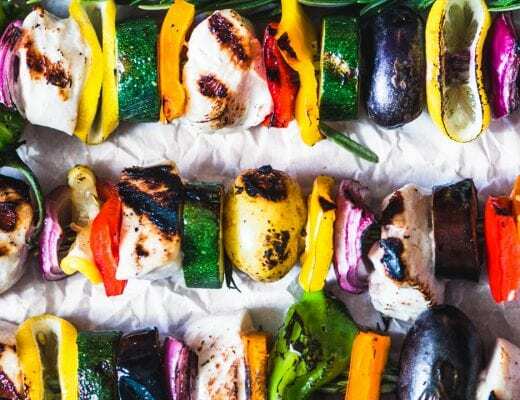 I love the combo of bright and sunny flavors with all those beautiful veggies and then the grilled chicken. Perfect for this time of year. I need this salad in my life, especially during this current heat wave. I bet it would be a fantastic lunch, too! I’m so intrigued by this spice box! 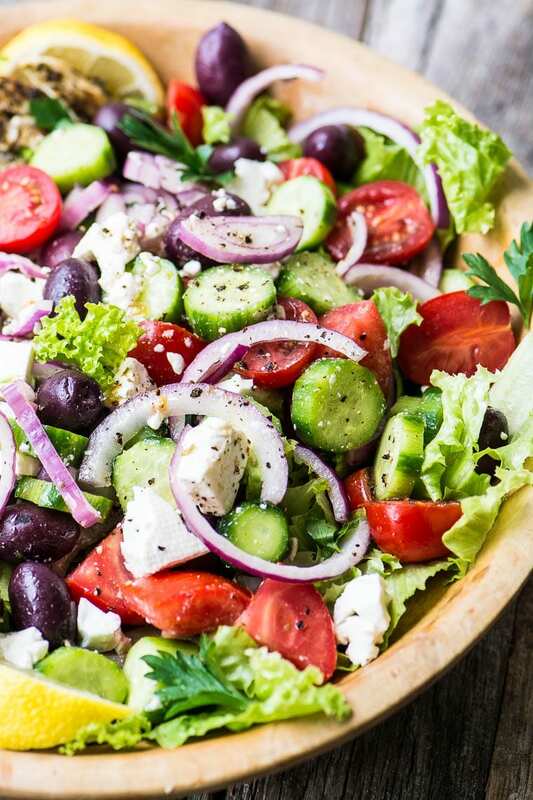 This Greek salad looks amazing and I am a sucker for the ones you get at that coffee place with the “you pick 2.” Can’t wait to make this at home. That chicken looks amazing! 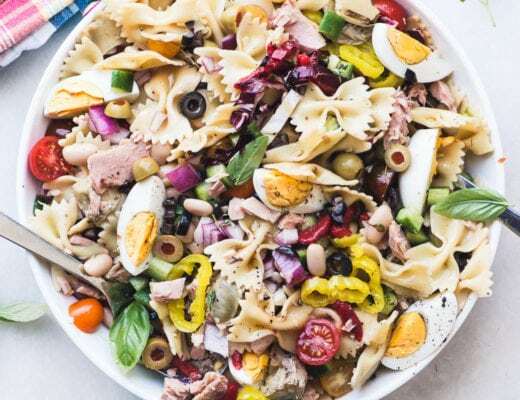 This salad is perfect for spring. I’m not a huge fan of plain chicken breasts, Brandi, but the spice rub really made a difference, these have so much flavor. I love a Greek salad. The colors are so pretty and vibrant, just lovely. Imagine my total surprise to see they are based out of here!? Totally toyable for us these test tubes. The tubes are really lovely and very tactile ~ and I’m glad you mentioned the mint, I’d never seen that either and I love it! This grilled chicken greek salad looks delicious. A perfect healthy salad. Yum Yum. What a great little spice kit, also this salad is perfection. Lots of crunch and color, my kind of salad. Isn’t the kit cute, Cheri? The glass tubes are really nice. This salad looks so healthy and refreshing, and I love the idea of a curated spice box! Yes, and the curated part comes in really handy when the cuisine is more exotic and unfamiliar. 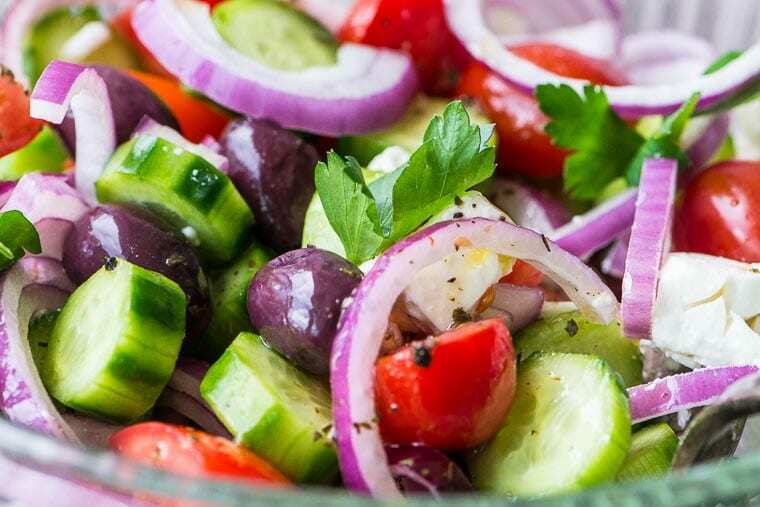 Greek salads are a constant in my house — first I love all the bright flavors, but also, since the mercury hovers at 88° for at least 6 months of the year, we need those refreshing salads to cool down! LOL! So true ~ and with this salad I love to serve the chicken still warm on the cool crisp salad ~ it’s fabulous! Oh, I love subscription boxes. I tried another Spice subscription but haven’t heard of Vital. I’m definitely going to check it out. And your salad looks scrumptious! I so agree, I think food subscriptions are such fun, I’d sign up for them all if I could :) Thanks for stopping by Julia. I think playing with spice combinations is one of my favorite parts of cooking and these spice exploration boxes seem like the perfect way to dabble in new ones. You may have tempted me to get involved since this greek chicken salad looks delicious but not like a spice combo I would’ve thought of myself! I love spices too, but we do get set in our ways…I usually pick mine up at the supermarket and they are pretty limited and the selection is static. I love to branch out but don’t always know where to find new ideas. For instance the mint in my Greek collection is powdered…I’ve never used mint that way ~ so cool! I had some roasted chicken salad today, delicious, but pretty boring. Yours looks so exciting with all the colours, and flavours, Sue. I love Greek salad, Angie, and I love that it can be a full meal this way :) Have a great week! 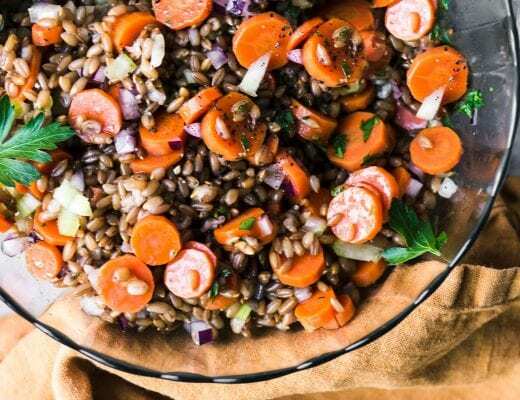 I’m with Jennifer- this salad looks completely satisfying with tons of flavor. The colors are so vibrant too – who could resist? I want one for breakfast! Wow, what a wonderful idea to have all these herbs perfectly combined and organized. I love it – as much as I love this vibrant, beautiful salad! Thanks Chris, and I agree, the idea of having them in little groupings is so smart ~ I think it encourages me to cook outside my comfort zone, too…now I just need a custom spice cabinet to keep them all organized!